Weddings are unique. And yet, paradoxically, they all have three things in common: they’re exciting, magical and stressful. As any couple planning on getting married can attest to, weddings are hard to plan, harder to organize and harder still to successfully host. There are a lot of factors that go into play for every wedding. From the number of guests invited to the venue to the food & drinks served at the reception, getting it all right is a tricky thing. This is why here at Events by Vivid, we’re happy to take the stress part out of your wedding so that you can enjoy this special ceremony. Our wedding planning services include all stages of wedding planning. Our professional wedding organizers plan for your wedding, arrange for your guests’ entertainment, hire limousines, and even offer to organize your honeymoon. That last point is very important. 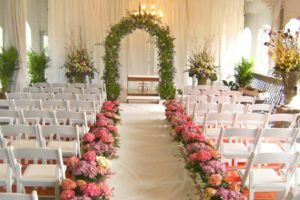 Ultimately, as every wedding is unique, some additional services that are not commonly offered by other event organizing services can be offered to satisfy our clients’ needs. For example, one of the less common requests some clients make is for us to hire cars for guests coming in from out of town. As we want to make your wedding the best it can be, we’re only too happy to try and satisfy every request made of us.